This beautiful part of Provence is home to Avignon and Orange, as well as many charming small towns. The Vaucluse is a département or French administrative division, in the region of Provence. It takes its name from one of its most famous sites, the Fontaine de Vaucluse, source of the Sorgue River. Vaucluse includes about 150 cities and towns, ranging from Avignon and Orange to the small charming towns of the Luberon, such as L'Isle-sur-la-Sorgue, Gordes, and Roussillon. Smaller villages, such as Ménerbes—made famous by Peter Mayle in his book, A Year in Provence, and Oppède le Vieux provide glimpses of times gone by. The Vaucluse includes the Massif du Luberon, a range of mountains to the west of the Alps. Popular for hiking and other outdoor activities, it is home to the Parc Naturel Régional du Luberon. Vaucluse is also the home of Mont Ventoux, the largest mountain in the region at an elevation of 1,912 meters (6,273 feet). Mont Ventoux, so named because of its high winds (vent means wind in French) is very popular with bikers. It has been part of the Tour de France a dozen times, and its steep climb is always challenging to riders. 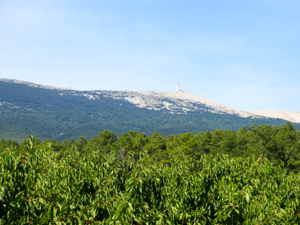 Just west of Mont Ventoux are the Dentelles de Montmirail, a small chain of jagged mountains. Dentelle is the French word for lace, and is an apt description of these hills. 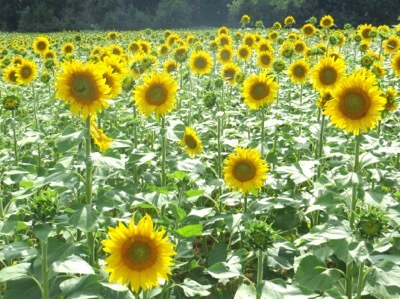 Throughout the area you'll find lush fields of lavender and sunflowers, so emblematic of Provence. With its history, culture, and natural beauty, the Vaucluse packs a lot into a relatively small area of Provence. 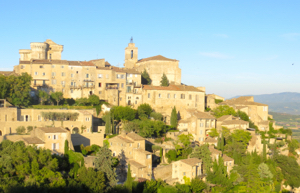 Below, Late afternoon sun on the hilltop town of Gordes.